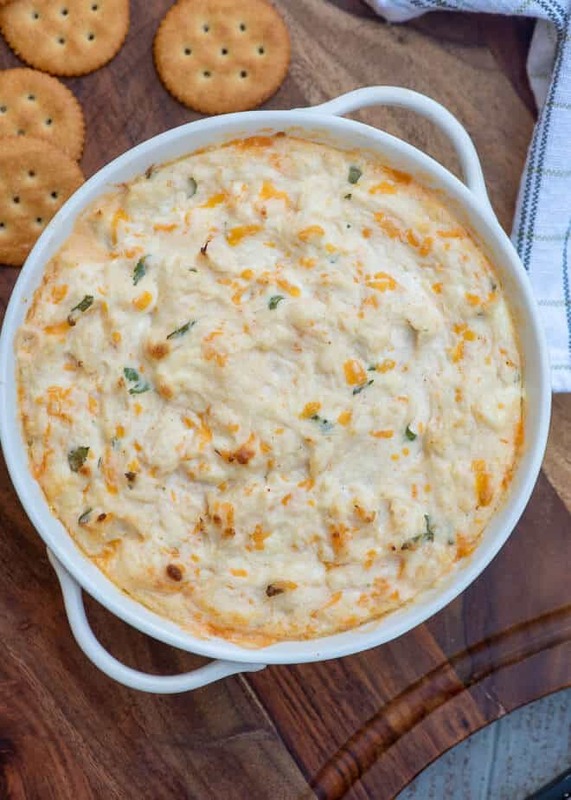 This Cheesy Hot Crab Dip is the ultimate party snack! 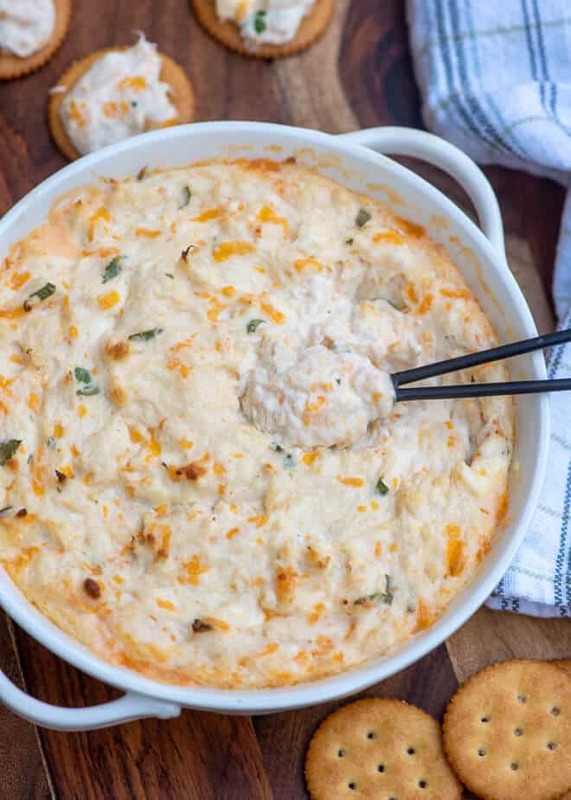 Lump crab meat is baked into this luxurious dip with cream cheese, sour cream, sharp cheddar cheese and few dashes of hot sauce. We are just 3 days away from the new year, friends. We made it! 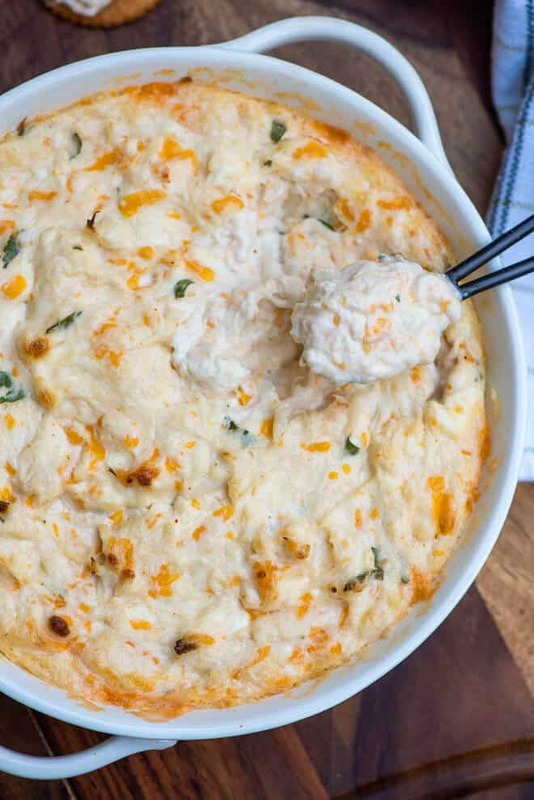 Just as we are recovering from the food coma that is Christmas, it’s time to plan what we’ll be consuming as the ball drops on New Year’s Eve and when I think New Year’s Eve I think crab dip. It’s decadent, cheesy, but at the same time a bit elegant. It also pairs perfectly with champagne, cocktails, or whatever you happen to be imbibing to welcome the new year. For me that may be iced tea so I won’t fall to sleep before the countdown. Sad but true. 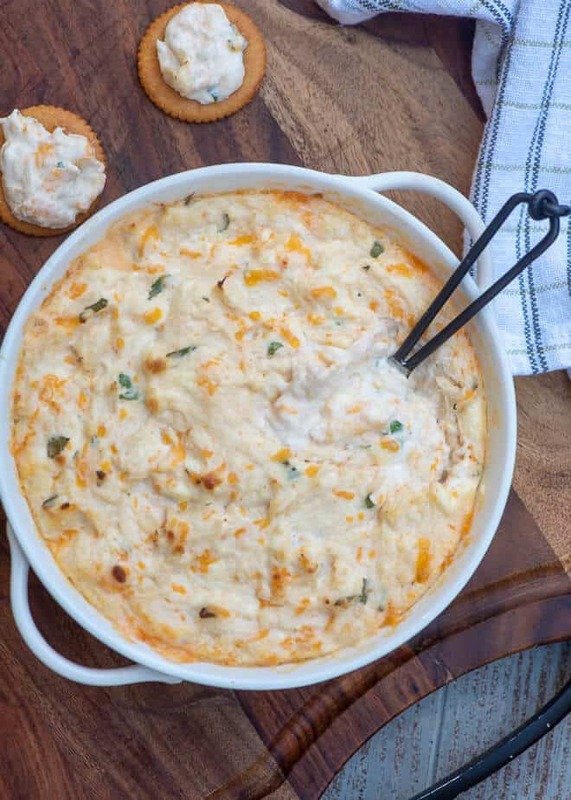 Lump crab meat comes canned and you also may find it at the butcher counter in some grocery stores. Don’t confuse it with imitation crab products, this stuff is the real deal and you want the real deal for this dip. The bonus to buying it canned is you can pick it while it’s on sale and stash it away until you need it. 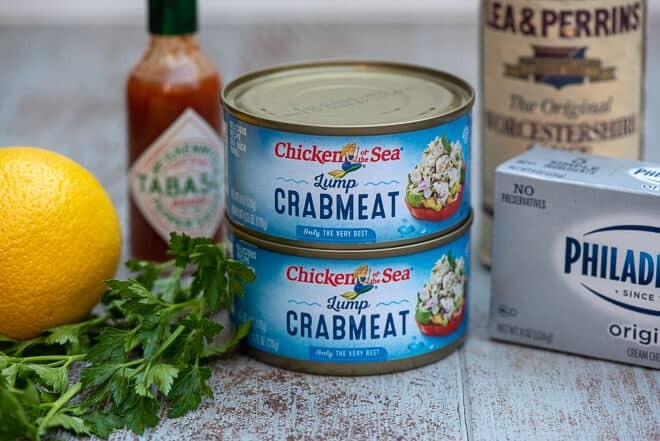 My local store carries Chicken of the Sea Lump Crabmeat but there are many other brands available so it may differ where you shop. 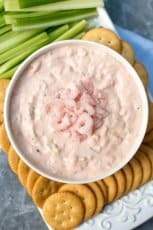 It consists of small chunks of jumbo lump crab and other nice quality pieces of crab meat and it is perfect for dips, crab cakes, and salads. Be sure to drain the cans well before adding them to the rest of the dip ingredients. The rest is easy, It’s just a matter of combining all of the ingredients and transferring the mixture to a small baking dish. You can cover the dish and refrigerate it overnight or bake it right away. Use a cheese grater to grate onion when you want to add onion flavor to a recipe without adding too much texture. A great choice when making dips, spreads, and meatballs. 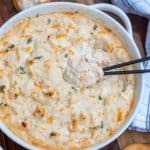 You can bake this dip in a small serving dish like I did here or in a small bread bowl with the added bonus that the serving dish will be edible! Once most of the dip has been consumed you can tear off chunks of dip soaked bread and eat the whole gosh darn thing. Most grocery store bakery departments carry small bread bowls over the holidays. 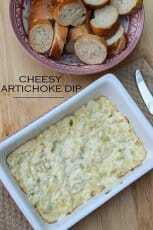 I like to serve this dip with Ritz crackers but it is also delicious with sliced baguette or tortilla chips for dipping. 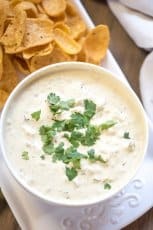 The “Hot” in the recipe title refers to the fact that this dip is served warm from the oven. Although it calls for a few shakes of Tabasco, it’s not a spicy dip. However, if you want to spice it up, feel free to add as much Tabasco as you’d like. You could even throw in a diced jalapeno for good measure. I like to keep things on the mild side when serving a crowd but if you know your group likes it hot, go for it! I hope you add this one to your party menu this New Year’s Eve or tuck it away for Super Bowl Sunday. It’s just around the corner. Enjoy and Happy New Year, friends! 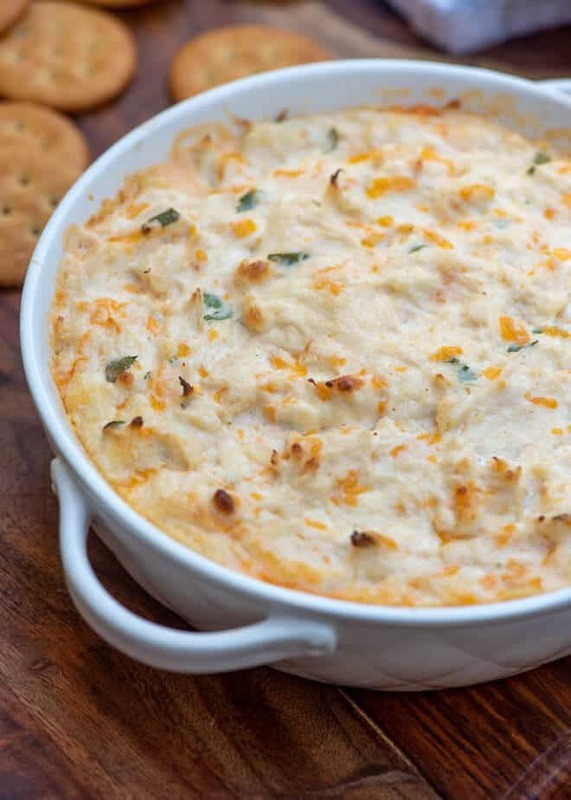 Place cream cheese, mayonnaise, and sour cream in a medium mixing bowl and stir until creamy. Add remaining ingredients and stir again until well combined. Transfer to a small baking dish and transfer to oven. 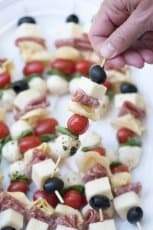 Serve with crackers, baguette slices, or tortilla chips. 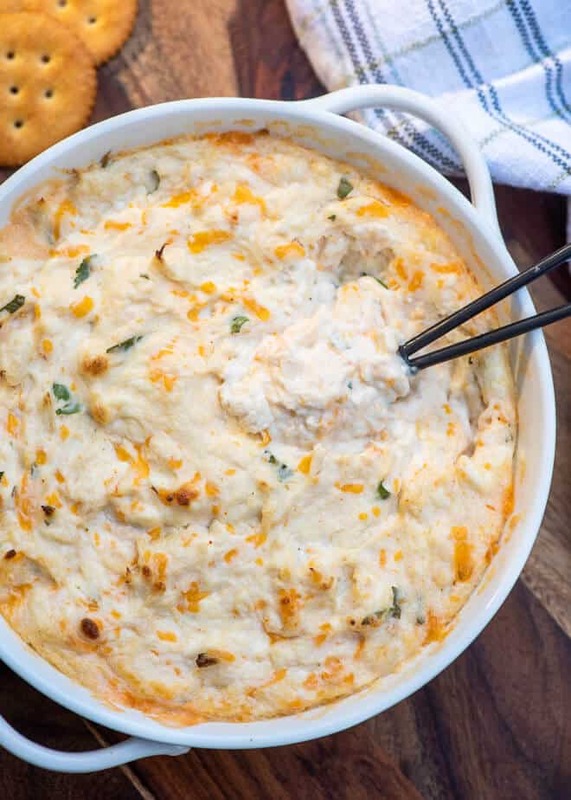 If you want add some spice to this dip, add a diced jalapeno and/or increase the amount of Tabasco, as desired. Once you transfer the mixture to a serving dish, cover the dish with plastic wrap and refrigerate overnight. When ready to bake, remove from the refrigerator and allow to sit out for 15 or 20 minutes before baking. You may need to increase the baking time a bit to compensate if the dip is very cold when going into the oven. Could this be made in a small crock pot? How long ago would you recommend in the crockpot? I haven’t tried it but believe it wouldn’t take more than 1-1/2 to 2 hours to be melted and ready to serve. Bla bla chicken of the sea is best and most economical at Walmart. This recipe is terrific! !